David Cameron announced on Friday he would step down as Conservative Party leader and prime minister in the autumn after losing a referendum on Britain’s European Union membership. Since Cameron campaigned fiercely for Britain to stay in the EU, the 52-percent vote to leave made his position untenable. His resignation is a huge loss. 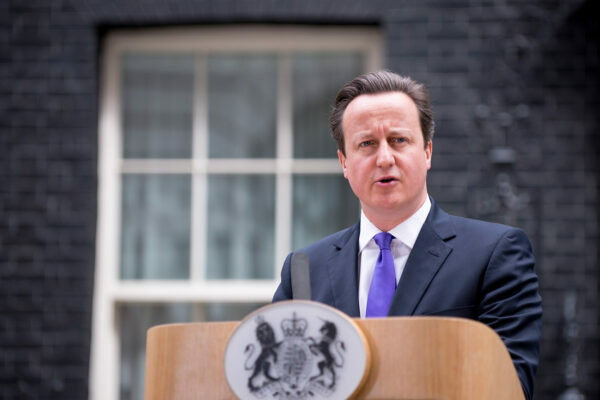 Cameron led the Conservatives to two election victories by making the right appealing to voters in the center again. His successor is likely to be more reactionary and will anyway be in thrall to the Euroskeptics for whom the outcome of the referendum is a vindication. Advocates of a British exit from the European Union have ramped up their attacks on Conservative Party leader David Cameron with some threatening to topple him no matter the outcome of the referendum next month. The Sunday Times quoted another lawmaker, who had apparently come unhinged, saying, “I don’t want to stab the prime minister in the back. I want to stab him in the front so I can see the expression on his face. You’d have to twist the knife, though, because we want it back for [George] Osborne,” Cameron’s deputy and possible successor. David Cameron set a date for Britain’s EU referendum on Saturday: June 23. “I believe Britain will be safer, stronger and better off in a reformed EU,” the prime minister said a day after winning concessions from other European leaders that give his country “special status” in the bloc. Cameron said withdrawing from the European Union as the first nation ever to do so would be a leap in the dark. After wrangling with other European leaders for two days, David Cameron emerged triumphant from a summit on Friday night, claiming to have negotiated a deal that gives Britain “special status” in the EU. The announcement signals the start of a referendum campaign in the United Kingdom about the island nation’s future in the bloc. Polls suggest that voters are evenly split on whether to stay in the EU or not. Few mainstream right-wing parties in the West are doing well. In Canada, Stephen Harper’s Conservatives lost power in November after almost a decade. In Portugal, a center-right leader had to make way for a coalition between the center-left and the far left. A similar alliance could come to power in Spain. In Germany and the Netherlands, Chancellor Angela Merkel and Prime Minister Mark Rutte have seen their popularity go down. In France, Marine Le Pen, the nationalist party leader, could beat the mainstream right into third place in next year’s presidential election. In the United States, Republicans are unlikely to take back the presidency in November if Hillary Clinton is the Democratic nominee. There has been one exception to the rule: In Britain, David Cameron not only won reelection last year but grew his party in the process. But it does not appear to meet one of Cameron’s key demands: a four-year ban on labor migrants from other EU nations claiming benefits in the United Kingdom. Cameron said there are still “details to be worked on” before he meets other leaders in Brussels later this month to finalize the deal. Prime Minister David Cameron seems in a hurry to secure changes in Britain’s relations with the rest of the European Union. If he got a deal next month, he could call a referendum on membership as early as this summer. Politico reports that Cameron has canceled talks with his counterparts from Denmark and Sweden this week to schedule meetings with officials in Brussels instead. Meanwhile, diplomats are working hard to find a compromise on Cameron’s most controversial demand: a four-year ban on labor migrants from other EU nations claiming benefits in the United Kingdom. The proposal is probably unacceptable in its current form, but Cameron has said he could live with an alternative that accomplishes much the same thing.